The number one cause of facial paralysis in the United States is Bell’s palsy, but not all patients who have facial paralysis have Bell’s palsy. Bell’s palsy is coined for any type of facial paralysis that does not have any other associated causes, such as tumors, trauma, and salivary gland inflammation. While Bell’s palsy is a very serious condition, please know that 85% of individuals who have Bell’s palsy completely recover from the condition with no noticeable deformity or issue. Moreover, patients with severe cases of facial paralysis who are believed to have Bell’s palsy may also need an Electromyography or an Electroneurography (ENoG). The treatment of Bell’s palsy is varied depending on the time and presentation. If you develop facial paralysis you need to immediately be evaluated, and other causes of facial paralysis such as tumor, trauma, and inner ear infection must be ruled out. 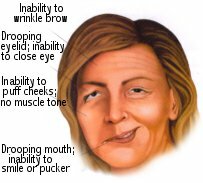 Once all other causes of facial paralysis have been ruled out, you are given the diagnosis of Bell’s palsy. If you are suffering from Bell’s palsy, you need to be treated immediately with high dose steroids, as well as antiviral medications like Famvir and Valtrex. It is imperative that these medications get started immediately. Once the immediate treatment has been initiated, careful follow up with a facial nerve paralysis expert, such as Dr. Azizzadeh, needs to be continued for the first year of treatment. Other issues that needs to be immediately attended to include eye protection. Patients who have total facial paralysis may have an inability to close their eyes completely (lagophthalmos). Patients who present with an inability to close their eyes are at a high risk of developing ulcerations and injury to their cornea. If you are suffering from Bell’s palsy and would like a more detailed explanation of your treatment options, know that we would have to evaluate your unique individual case before deciding what treatment option would work best. If you are looking for ways to treat Bell’s palsy, schedule a consultation with Beverly Hills facial paralysis expert Dr. Azizzadeh by calling (310) 657-2203 today or scheduling a Skype conversation!